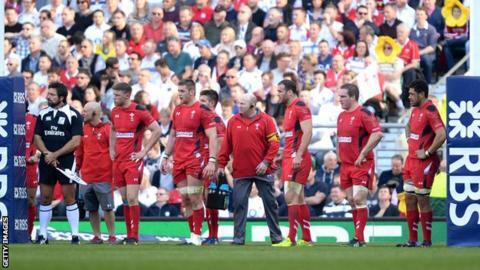 Wales's 28-16 defeat in 2014 was their first loss against England in four matches. Venue: Millennium Stadium, Cardiff Date: Friday, 6 February Kick-off: 20:05 GMT Coverage: Live on BBC TV, HD, Red Button, Radio 5 live, BBC Radio Wales, Radio Cymru, the BBC Sport website, S4C online, mobile, the BBC Sport app and Connected TV. Rob Howley says Wales' 30-3 win over England in 2013 will be irrelevant when the teams meet on Friday. Instead, attack coach Howley believes last season's 29-18 loss at Twickenham will be the spur for Wales in the opening match of the 2015 Six Nations. "Forget about what happened in 2013, that was two years ago," said the former scrum-half. "It's about performing in the present and we're hugely motivated because we lost comfortably last year." Wales' record-breaking triumph in the 2013 tournament clinched a second successive Championship. The defeat in Twickenham a year later saw England claim their first Triple Crown in 11 years. Wales are favourites for this season's meeting, with coach Warren Gatland naming a full-strength side two days ahead of schedule. His England counterpart Stuart Lancaster has been hit by a string of injuries and has selected a team showing six changes from the the side that beat Australia in the autumn. His team has five players making their Six Nations debuts - including fly-half George Ford and centre Jonathan Joseph, who will partner Luther Burrell. That has led to speculation Wales will attempt to exploit the England midfield's lack of experience, something Howley agrees could be a possibility. "I think George Ford is a very good defender, but England's 12 and 13 is a new combination. When you look at ours they're pretty much cemented," added Howley. "You have to try and take advantage of that some time in the game and hopefully that opportunity will present itself early on. "If it doesn't we have to show a bit of patience and composure, but it's the variety of your game that's going to be key on Friday because they all anticipate us going down the 10 channel, don't they?" Lancaster suggested on Wednesday that England would ask for the Millennium Stadium roof to be open provided the weather is dry, in spite of a challenge by Gatland to play under the closed roof. It is thought opening the roof reduces the crowd noise but Lancaster has nonetheless had his players training in front of loud speakers on Wednesday, a move designed to mimic the raucous atmosphere at the stadium. Howley, who played 59 times for Wales, says it is up to the players to encourage the crowd to create an atmosphere. "We need to start well and if we start well if we start well the crowd will have an influence," he said.